Stayed Jul 15 The Villa, service and staff were nothing short of spectacular and highly recommended for a relaxed getaway from the crowds. Still within easy walking distance of local restaurants. Thanks again, I will be back soon I hope! 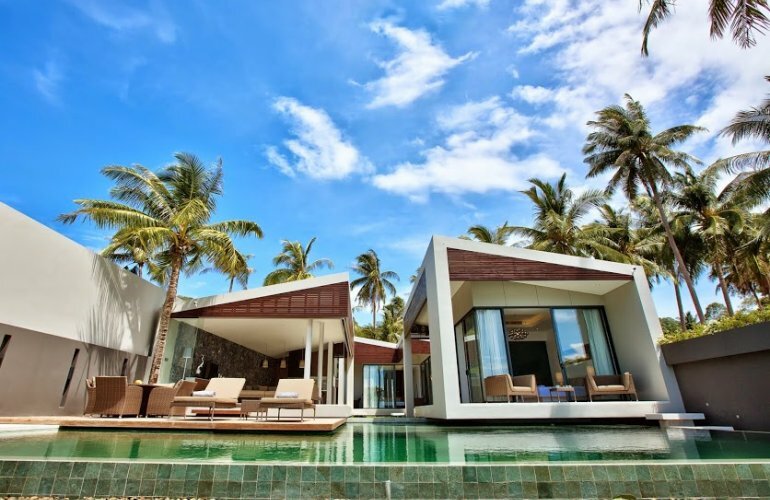 Nestled in an exquisite beachfront location in north-western Koh Samui this exceptional luxury villa rental is simply breath-taking. Built in an exclusive development directly on Laem Noi beach this brand new property is one of two matching homes offering immaculate island living within easy reach of the beach and an array of exceptional facilities. Backed by lush tropical gardens and facing the calm azure ocean this 3-bedroom villa in Ko Samui is located near to the Four Seasons Resort and the port town of Nathon. This innovatively designed ‘smart home’ offers stylish open-plan living with an array of high-tech features and impressive amenities. From slide-away walls and remote controlled lights to multi-camera CCTV, iPad controlled music and designer furnishings - this contemporary home will impress even the most discerning traveller. Located in a secure and gated estate the property is the perfect blend of space, sophistication and tropical charm. An immaculately manicured pathway leads through the heart of the home, from a gated courtyard at the rear to a splendid beachfront deck overlooking Laem Noi’s powder white sands and crystal clear waters. Palm-fringed gardens surround the stunning outside space which boasts an infinity-edge pool, ‘floating’ sun decks, luxury sun-loungers, an alfresco dining area and relaxing beach sala for the ultimate island experience. Two of the villa’s three imposing pavilions ‘hover’ over the pool in a fusion of natural harmony and impressive architectural accomplishment. Just a few steps from the oceanfront pool lies the magnificent living pavilion; this remarkable room features slide-away walls allowing the inside space to flow out into one seamless expanse. Home to the lounge, kitchen and dining area, the pavilion is finished to the most exacting standards with lofty white ceilings, stylish terrazzo flooring and a carefully selected assortment of high-end fixtures and fittings. To the far end lies a minimalist kitchen with ‘hidden’ units, smooth white worktops and a unique extractor element that smartly ‘hovers’ over the breakfast bar. A selection of built-in designer appliances includes an oven and induction hob, a Teppan Yaki griddle, a fridge-freezer, dishwasher, coffee machine and wine cooler. The kitchen serves an adjacent dining area furnished with a heavy Bali-style dining table with seating for six. Set against a stone wall backdrop, the area is finished with organic materials, natural elements and neutral shades that blend perfectly the sense of sanctuary throughout. An inviting lounge area is located at the front of the room featuring rattan-style furnishings in neutral shades, wall mounted 3D LCD TV, blue ray player and remote controlled lighting and sound. Vast floor-to-ceiling blinds open electronically allowing the entire pavilion to open from the inside out in a fusion of light, warmth and space. From the lounge guests can enjoy spectacular views over the stunning coastline as well as easy access to the sun deck and pool. Three king-size bedrooms are located in two further pavilions; the first is situated to the rear of the home featuring two spacious rooms, each equipped with designer furnishings, smooth tiled floors, private patios and en-suite bathrooms with rain showers. A second master pavilion enjoys a prime beachfront location with slide-away walls, a private furnished patio and spectacular sea views. Designer furnishings include an impressive king-size bed, large wardrobes, sofa seating and stylish features in soft gentle shades. An elegant en-suite bathroom features a white terrazzo bath tub, basin and rain shower backed by grey terrazzo flooring and walls. Luxury bathrobes and slippers are provided in each of the bedrooms. This private villa in Koh Samui is a true testament to luxury island living and the perfect place to enjoy your luxury tropical break. To reserve this villa we require a completed booking form and an initial deposit of 50% of the total amount due. For bookings of less than 1 week (3 - 6 nights) or for bookings made within 8 weeks of arrival, full payment is required at the time of the booking. Payment of the outstanding balance must be received at least 8 weeks prior to arrival.